spring of fresh cold water and green pastures all over the cliff. People enjoy themselves by climbing the cliff and see around it. District Kishtwar in the past used to be an independent hill principality and was merged with the State of Jammu and Kashmir in 1821, A.D. With the passage of time Kishtwar became a Tehsil of District Udhampur and remained its part till 1948, when it became part of newly created District Doda in the wake of first re-organization of the state during the post-independence period. Kishtwar branches off in Marwa-Wadwan valley, Paddar valley, Chatroo valley and is flanked by lofty Himalayas from all sides. The monsoon hardly reaches this part of the State which makes it a drought prone area and insufficient in food grains in particular the Marwah-Wardwan area which remains cut off for 5-6 months in a year due to snowfall in winter. In order to avoid any starvation death sufficient stocks of food grains and other essential commodities are stored well in advance in these areas so that the public may not suffer on this account. Kishtwar is having lot of potential for generation of Hydro Electric Power. One of the major projects is Dul-Hasti which was commissioned in April 2007. 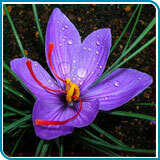 Kishtwar is popularly known as 'Land of Sapphire and Saffron' is also very rich in forest products. The richest forests in Jammu and Kashmir are found on the high mountains and hills of Kishtwar. Kishtwar is linked with other parts of the state by an all weather road, Nathional Highway 1-B, which remains open throughout the year Kishtwar is also connected with Kashmir Valley by Chatroo-Synthan road, which is being upgraded into National Highway Kishtwar is situated on the banks of the Chenab the town has remained very famous for its natural beauty, religious places and political supremacy. Kishtwar is situated 284 kilometers far from Srinagar, . In 1981 the area of Notified Area Committee, Kishtwar , was 0.63 square kilometer, which has expanded much during the last 21 years.